My house faces west so it gets full sun most of the day. I have a storm door that has a heat rejection film ( gila platinum). This film makes a slight mirror image when in front of it. I have 2 crows that will not stop pecking it, all day. I have tried scaring them off to no avail. I don't think they can hurt the glass, but they are pooping all over the stoop at the front door. Normally i don't like to kill things for the heck of it. But i don't see a way around getting out the shotgun. I need the heat film on the door to keep the front door from getting too hot. One of the previous doors ( it was metal) got so hot you could not touch it , and the insulation would melt and leak out around the small door window. This is a fiberglass wood look door, and i don't want it getting hot either, so the film stays on the storm door. Any options you see other than shooting them? My wife is not going to let me put a fake owl or anything like that. We have an outside cat, but she does not stay at the front door. Better check the law on this before you kill a crow. Might be a federal crime to kill one. Migratory birds and whatnot. I had a robin that had a vendetta against me. He would do the same as your crows. Every day. All day long. He's leave in the winter and return again the next spring. He was getting older and turning gray but that didn't stop his incessant pecking. Finally, one winter he left and never returned. So, I have no ideas other than old man Father Time. We had a similar problem with doves in our back yard. They were always getting into our dog's water bowl and generally making a mess with their droppings. 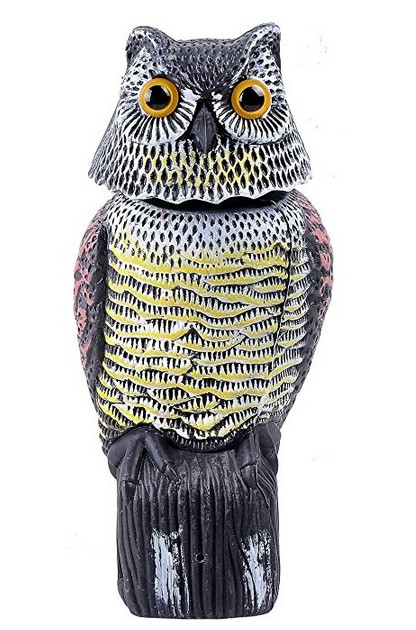 Bought a decoy owl similar to this at an auction for a couple of bucks. Amazon sells them for between $13 and $25. The head is messed-up and doesn't bobble but it is still effective. No birds! I had that problem last year with a Robin. It would attack the window and it didn't have film on it. It did it on 3 different windows. Why not put a white covering over the mirror at ground level? They think it's another crow...no image to peck at, they'll move on. Add an owl decoy, or let the wife clean up the poop. Crows don't like noisy things. Hang a Wind-Chime near your front door. That could annoy them to not come around.. Your Wife may not want an Owl Decoy, buy they may work. If you use an Owl Decoy, (crows are smart) move it around so it's not in the same place everyday. Please don't hurt the crows. They are really smart but in this case they are curious because of the mirror. +1. Wife not letting him is the most ridiculous reason Ive ever heard. Or else poison the thing and be done. Did the door come with a screen insert? Put it on in front of the mirror? Apparently you're in an area where shooting isn't an issue. Deal with your problem as you see fit and don't come on the internet and talk about it. It's interesting that a full length reflective mirror is OK at the front door but an owl decoy isn't but people like what they like. I talked her into an owl decoy, ordered one today. spasm3 Cool! Let me know how it works. FWIW, I placed the decoy in an antique bird bath (we keep it dry) in the center of the yard near our dog's water bowl - kind of overlooking that area. Last edited by David2431; 04/07/18 01:32 PM. The owl decoy is likely to attract crows. They are constantly dive bombing all raptors around me, even eagles. Crows are smart so getting rid of them is difficult when they are determined. U can kill one or two with the shotgun if U are lucky enough to get a shot off, but likely more will show up, especially with that fake owl. Change what is attracting them is your only solution trust me. Would be glad to have them around our home. I like crows. They are very intelligent and entertaining to have around. So the poop. What doesn't? Clean it up and leave them alone. I used to shoot crows. One yr I shot a deer with my muzzleloader, yes a real one with a patched round ball and real black powder and not the inline garbage. Anyway, I hung up the deer, skinned it out and threw the fat pieces in the yard to pick up later (this was before I got married). Early the next morning there were two dozen crows and one raven cleaning up my mess. Never shot another crow again.